Since Estonia gained independence from the Soviet Union in 1991, the country has wasted no time in welcoming visitors to its seaport capital of Tallinn, a wonderful old medieval city that takes great pride in its UNESCO World Heritage status. At Manniva, just along the Baltic coast from Tallinn, the 27-hole modern golf complex at the Estonian Golf & Country Club is recognised as one of the best in Eastern Europe and it has been attracting a growing number of golfers to its fairways since it first opened in 2005. 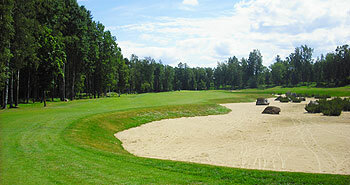 One of only eight accredited PGA Tour venues in Europe, the Estonian’s 18-hole Sea course and 9-hole Stone layout were created by Finnish designer Lassi-Pekka Tilander on a site of historical significance where a number of archaeological artifacts – including arrow heads, coins and pottery – were found during construction. Situated on the delta of the Jägala River, the Sea course is routed over three distinct types of terrain: parkland, heathland and links. Water hazards feature at several holes, most effectively at the signature par four 13th where the tee shot must avoid a rather prominent lake on the right as the fairway doglegs to the green. The 182-yard par three 17th hole was upgraded in 2011 when the large water hazard in front of the green was replaced with an area of sandy scrubland, enhancing the aesthetics of the hole with boulders, native shrubs and a striking water feature that runs through the middle. The scrubland – as with similar areas between the 482-yard par five 6th and 408-yard par four 7th holes – is not deemed a hazard therefore golfers can ground their club before playing from the sand. The Estonian Golf and Country Club was honoured to host the 2009 Omega Mission Hills World Cup European Qualifiers, with 2-man national teams battling to win places at the tournament proper in China. The Sea course at the Estonian Golf & Country Club is a parkland course set 30mins out of Tallinn. My initial thoughts were that it had started in fairly generic fashion and didn't impress, but as the round went on it grew on me. The design is very interesting from the back tees and there are some spectacular players holes at 2, 6, 7, 12 and 13, especially the waste bunker holes at 6 and 7. It's pleasant, rural, calm and interesting. I played with two locals and they were great company providing histories of the area and having that casual friendly banter between each other so common in golfing mates worldwide.I also found the town of Tallinn to be a lovely place for a short break, having caught the ferry over from Helsinki. Opened in 2005 but with history dating back 5000 years, Estonia Golf and Country club is set above the Baltic sea approximately 30 minutes from the city of Tallinn.Under the umbrella of European Tour courses, the Sea course is a challenging 18-hole course that leads down from the iconic clubhouse towards the sea and around some notable boulders relocated the area during the ice age.The turf is crispy and sand based so the course plays like a parkland/links hybrid, but the design is that of a parkland course. Spread over a large area of land, the Sea Course presents several signature holes that will get the attention of your golf and your camera.The par-5 opening hole leads you from the former limestone sea wall down between the forest land to a green protected by water. Undoubtably you will stand on the second tee already entertained and exhausted by the shots and challenge the first hole requires of you.The picturesque third hole is a straight away par-4 that guides you from the high-up forest terrain to the edge of the Baltic sea where the course gets its name.The remaining holes mix twisting par 4s and 5s leading back and forth from the hole upon which the clubhouse sits proudly atop, with flat holes nearer the sea that offer a more gentle challenge, both on your body and your scorecard.The one feature missing from the course is a set of signature par-3s. For a course designed relatively recently, it offers 4 par-3s that lack the drama and character that the course deserves. The group of short holes are fine holes but will not be the first topic of conversation as you marvel at an Estonian sunset on the second floor of the clubhouse.The remote location of the course and relatively small, but growing, golfing interest in Estonia does offer two benefits for visiting golfers. First is an affordable and enjoyable test of golf, second is the service offered by the club which is exceptional. Estonia has only been an independent country for little over 20 years so we have to remember that everything regarding tourism and leisure is still very much in it’s infancy. With regard to the golf offering I think that there are seven courses in the country with four in the Tallinn area. The Sea course at the Estonian Golf & Country Club is certainly the #1 course and after I played recently, I am genuinely impressed. Before golf you have a great clubhouse to enjoy with some fine views over the course that reach out to sea. The course starts with a decent par-5 and then an attractive short par-4 with water on the left and right sides of the fairway at landing distance. There are a few ‘wow’ moments around the course and the first may just be on the 3rd tee, an elevated view of a par-4 with the Gulf of Finland as the backdrop. The 6th hole is a beauty – a par-5 with waste-ground on the right side that starts at about 240 yards and continues until 100 yards short of the hole. The front nine ends with another par-4 that is under 400 yards, this is slightly uphill and an accurate shot brought in from a height is a must to hold the green. I am sure many with have the 13th hole as their favourite (it is mine) – here we have a par-4 around 400 yards with a large expanse of water down the right-side – this is in play off the tee and approaching the green too – a great looking hole. The 15th is the longest hole at around 550 yards and also the closest to the sea, again with some very nice views across the Gulf. The last hole to mention is also the last hole on the course, an uphill par-5 with a great green-site just below the clubhouse – a very strong finish. As I said at the beginning, this is early times for golf in Estonia but this is a great course already and will mature into a European favourite over the coming years – in fact the European Tour have added their support already by including this as a ‘European Tour Course’ – NB . At the country club, there is also a nine hole course, called Stone which is a decent warm-up to the Sea course – there are plans to increase this to a full eighteen holes too. There are a number of golf and city break options to take-in the city of Tallinn including the medieval old town, which is great fun and this trip gets the thumbs-up from me.